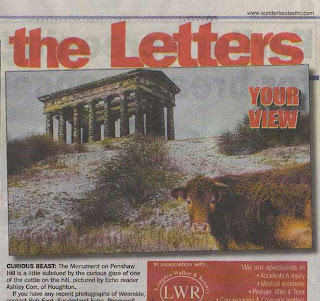 Every now and again I send a few photographs to the Sunderland Echo newspaper as they run a daily article on the letters page called 'Your View'. My Blog already shows a selection of my work 'In Print', but if you haven't already seen them, here's some more. I submitted a handful of my most recent photographs and it's been a good week as they've all been featured! The First two appeared on a double spread feature called 'Freeze Frame' where readers snow scenes were shown, and there were some great ones at that. Image one is Durham City, with Hylton Castle shown underneath. The third photo features a rather menacing bull that was grazing near the foot of Penshaw Hill. With the monument in the background it made a nice composition but I had to keep me eye on that beast as it gave me a very peed-off look! I survived. 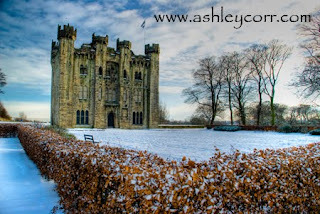 The last photo is another Hylton Castle snowscape. The people from Sunderland Echo trimmed the image, which is originally an 8-stitch panorama, but it still works quite well. So, it's been a good week all round, with four images going into print and another four hitting the telly screen on ITV's regional weather bulletin. I've got one or two other projects in the pipeline but as soon as they're out the door I'll be submitting more images to press and TV - possibly national photography magazines too. Mind you, I'm not complaining about the exposure, it's great, but nothing beats the outdoors with the camera in tow. Time spent promoting my work often means less time in the field, but hopefully I'll put that right this coming weekend. Batteries are charged - just waiting for a bit decent weather and I'm off out. 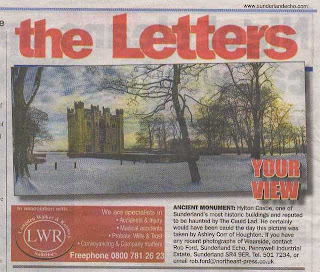 Yes, three days after my Hylton Castle photograph appeared on Tyne Tees Television, I had another one shown on Friday night. 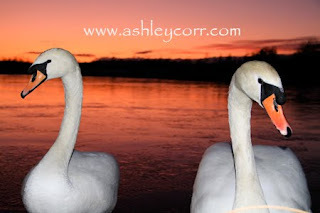 Again, it was during the weather forecast and this time it was an image that was captured on my new Canon 7D - a pair of Mute Swans at sunset. 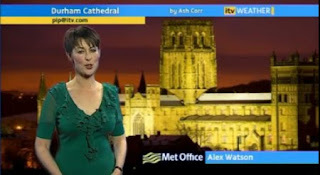 There was no introduction this time, just a quick appearance of the photo as the weather forecast was being broadcast. Still, two in one week has taken me by surprise and I won't be stopping there. I'm developing a slight addiction to this game...he he. 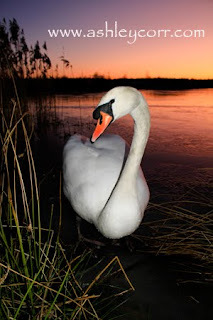 Tonight I had another photograph of mine shown on our regional ITV channel. I only submitted it yesterday and even though my last entry was shown the day after I emailed it to them, I wasn't expecting a repeat performance. 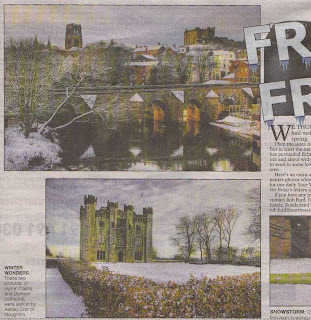 So, what a nice surprise it was to see my snow scene of Hylton Castle on TV. After watching the show I then checked my emails and the weather presenter, Pip Thomson, had been in touch earlier to say the image I sent in was fantastic and she's definately be using it, so I had to keep a look out. I was quite chuffed! That's the second photo I've had shown on the same programme over the last few weeks. I'll be sending more weather shots in over the forthcoming weeks and may even try my luck with BBC 'Look North' too. It's been a while since my last blog entry, mainly due to the fact that I haven't been out and about with my Nikon D80. There's a good reason for this - I got shot of it! I felt the time was right for an upgrade and I like to work with one camera alone so I went and treat myself to a brand spanking new Canon 7D. Turning my back on Nikon wasn't a hard decision and I done my research before switching sides, so to speak. The new toy pulls in massive images, which is just what I need when planning to make the jump to high-format printing. I mean, with a capability of 18 Megapixels, and a single RAW shot weighing in at 50 Megabytes, this camera is right up my street. Of course, these things don't come cheap. When you tot-up the add on's - Extra glass, Battery grip and Circular Polariser, you're gonna want a decent return on your outlay. Well, things are taking shape just nicely so I'll keep you all posted on developments. Ok, enough of the prattle. Here are a couple of Jpeg's I shot with the new toy. I hope you like them. Speak soon.